For decades, scientists have believed that there could be life beneath the icy surface of Jupiter's moon Europa. Since that time, multiple lines of evidence have emerged that suggest that it is not alone. 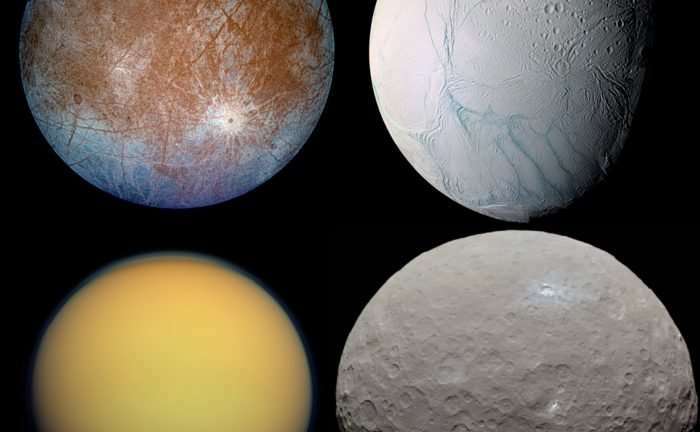 Indeed, within the Solar System, there are many "ocean worlds" that could potentially host life, including Ceres, Ganymede, Enceladus, Titan, Dione, Triton, and maybe even Pluto. The study, titled "Is extraterrestrial life suppressed on subsurface ocean worlds due to the paucity of bioessential elements?" recently appeared online. The study was led by Manasavi Lingam, a postdoc student at the Institute for Theory and Computation (ITC) at Harvard University and the CfA, with the support of Abraham Loeb – the director of the ITC and the Frank B. Baird, Jr. Professor of Science at Harvard. 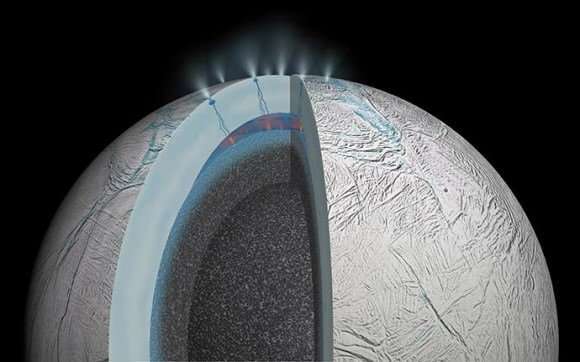 In previous studies, questions on the habitability of moons and other planets have tended to focus on the existence of water. This has been true when it comes to the study of planets and moons within the Solar System, and especially true when it comes the study of extra-solar planets. 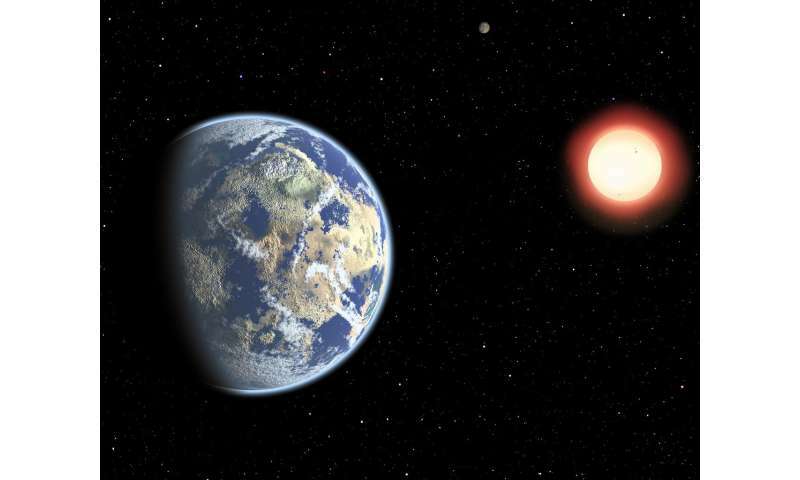 When they have found new exoplanets, astronomers have paid close attention to whether or not the planet in question orbits within its star's habitable zone. "The mostly commonly accepted list of elements necessary for life as we know it comprises of hydrogen, oxygen, carbon, nitrogen and sulphur. In addition, certain trace metals (e.g. iron and molybdenum) may also be valuable for life as we know it, but the list of bioessential trace metals is subject to a higher degree of uncertainty and variability." For their purposes, Dr. Lingam and Prof. Loeb created a model using Earth's oceans to determine how the sources and sinks – i.e. the factors that add or deplete LN elements into oceans, respectively – could be similar to those on ocean worlds. On Earth, the sources of these nutrients include fluvial (from rivers), atmospheric and glacial sources, with energy being provided by sunlight. "If the sinks are much more dominant than the sources, it could indicate that the elements would be depleted relatively quickly. In other to estimate the magnitudes of the sources and sinks, we drew upon our knowledge of the Earth and coupled it with other basic parameters of these ocean worlds such as the pH of the ocean, the size of the world, etc. known from observations/theoretical models." While atmospheric sources would not be available to interior oceans, Dr. Lingham and Prof. Loeb considered the contribution played by hydrothermal vents. Already, there is abundant evidence that these exist on Europa, Enceladus, and other ocean worlds. They also considered abiotic sources, which consist of minerals leached from rocks by rain on Earth, but would consist of the weathering of rocks by these moons' interior oceans. "We found that, as per the assumptions in our model, phosphorus, which is one of the bioessential elements, is depleted over fast timescales (by geological standards) on ocean worlds whose oceans are neutral or alkaline in nature, and which possess hydrothermal activity (i.e. hydrothermal vent systems at the ocean floor). Hence, our work suggests that life may exist in low concentrations globally in these ocean worlds (or be present only in local patches), and may therefore not be easily detectable." This naturally has implications for missions destined for Europa and other moons in the outer Solar System. 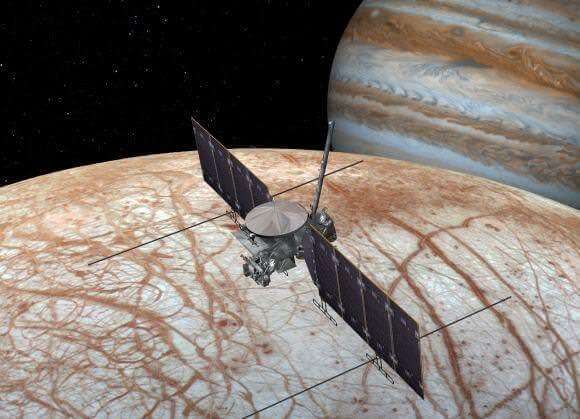 These include the NASA Europa Clipper mission, which is currently scheduled to launch between 2022 and 2025. Through a series of flybys of Europa, this probe will attempt to measure biomarkers in the plume activity coming from the moon's surface. 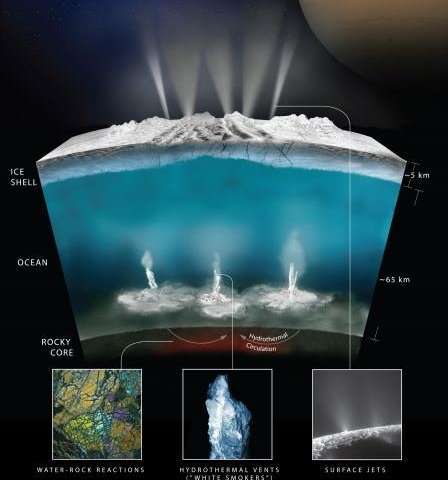 Similar missions have been proposed for Enceladus, and NASA is also considering a "Dragonfly" mission to explore Titan's atmosphere, surface and methane lakes. However, if Dr. Lingam and Prof. Loeb's study is correct, then the chances of these missions finding any signs of life on an ocean world in the Solar System are rather slim. Nevertheless, as Lingam indicated, they still believe that such missions should be mounted. "Although our model predicts that future space missions to these worlds might have low chances of success in terms of detecting extraterrestrial life, we believe that such missions are still worthy of being pursued," he said. "This is because they will offer an excellent opportunity to: (i) test and/or falsify the key predictions of our model, and (ii) collect more data and improve our understanding of ocean worlds and their biogeochemical cycles." In addition, as Prof. Loeb indicated via email, this study was focused on "life as we know it". If a mission to these worlds did find sources of extra-terrestrial life, then it would indicate that life can arise from conditions and elements that we are not familiar with. As such, the exploration of Europa and other ocean worlds is not only advisable, but necessary. "Our paper shows that elements that are essential for the 'chemistry-of-life-as-we-know-it', such as phosphorous, are depleted in subsurface oceans," he said. "As a result, life would be challenging in the oceans suspected to exist under the surface ice of Europa or Enceladus. If future missions confirm the depleted level of phosphorous but nevertheless find life in these oceans, then we would know of a new chemical path for life other than the one on Earth." In the end, scientists are forced to take the "low-hanging fruit" approach when it comes to searching for life in the universe . Until such time that we find life beyond Earth, all of our educated guesses will be based on life as it exists here. I can't imagine a better reason to get out there and explore the universe than this! Pluto is missing from the montage of ocean worlds.